Melissa Day Cream effectively cares for combination skin. Oily areas are calmed, dry patches are hydrated, the appearance of redness is reduced, and shine is controlled for a balanced, radiant complexion. Formulation: Extracts of melissa, daisy, anthyllis, witch hazel and carrot all soothe, working to balance the skin’s natural oil and water content. Tapioca starch provides an even, matte appearance. Each morning after cleansing and toning, apply a small amount evenly to the face, neck and décolleté with your fingers. If breakouts and frequent blemishes are a problem, substitute Melissa Day Cream with a mixture of Revitalising Day Cream and 1-2 drops of Clarifying Day Oil. Melissa Day Cream is perfect as a primer before applying make-up. In the evening, we recommend using Night Serum or Sensitive Care Conditioner. Water (Aqua), Helianthus Annuus (Sunflower) Seed Oil, Alcohol, Glycerin, Manihot Utilissima (Tapioca) Starch, Cocos Nucifera (Coconut) Oil, Glyceryl Stearate Citrate, Melissa Officinalis Flower/Leaf/Stem Extract, Arachis Hypogaea (Peanut) Oil, Simmondsia Chinensis (Jojoba) Seed Oil, Prunus Armeniaca (Apricot) Kernel Oil, Anthyllis Vulneraria Extract, Bellis Perennis (Daisy) Flower Extract, Tropaeolum Majus Flower/Leaf/Stem Extract, Hamamelis Virginiana (Witch Hazel) Bark/Leaf Extract, Cetearyl Alcohol, Triticum Vulgare (Wheat) Bran Extract, Daucus Carota Sativa (Carrot) Root Extract, Fragrance (Parfum)*, Citral*, Limonene*, Geraniol*, Citronellol*, Linalool*, Hectorite, Lysolecithin, Xanthan Gum, Coco-Glucoside, Zinc Oxide (CI 77947). Favourite moisturiser of mine, used with Facial Toner. A great product combination for male skin. I’ve been using this for months and it’s great for combination skin. It has a matte effect that gets rid of of shining T bar on your face. No more checking for shining patches on my face. Highly recommend. Admittedly I have hormonally changing skin, however this cream I think will be better for me to use in the Autumn/Winter as it seems too heavy and makes my combination skin more oily. That said, it is a good moisturiser. For the Spring/Summer I am now using the Revitalising moisturiser with a couple of drops of the clarifying day oil. Perfect. 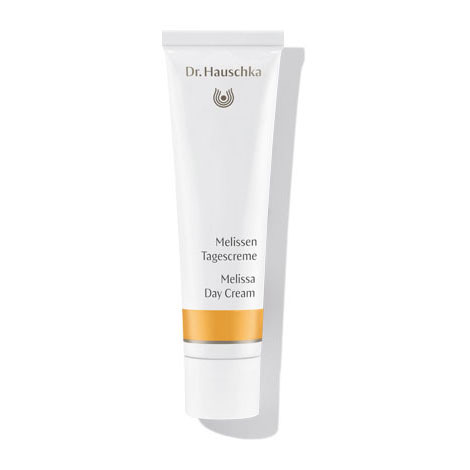 Thank you for that website tip Dr Hauschka. My favourite day-to-day face cream EVER. You really notice a difference after using it... even only a few days. It is a nice consistency, the tube lasts a while and you don't even know you have it on. I put make up straight on top. Best moisturiser I’ve ever used! As in the title it really is the best product I’ve ever used. My skin is problematic prone to breakouts and this moisturiser is not heavy nor too light, I feel my skin balance after using it. Skin looks and feels better! Melissa Day Cream soothes sensitive combination skin and reduces oily shine. An ideal base for make-up.